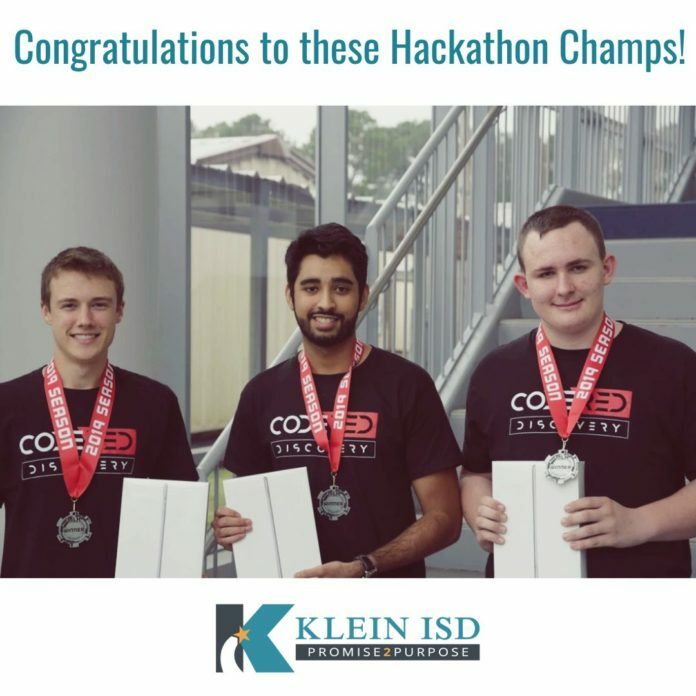 Klein Collins seniors Kael Kirk, Shan Memon and Jeffery Hatch compete and secure second place at CodeRED Discovery Hackathon located at the University of Houston - Main Campus. Klein Collins seniors Kael Kirk, Shan Memon and Jeffery Hatch with their medals and iPads! CodeRED Discovery at the University of Houston – Main Campus is a hackathon that is run by Major League Hacking, an organization that hosts hackathons around the world. The challenge during hackathons is to create a new product relating to a given theme…in 24 hours. Klein Collins High School seniors Shan Memon, Kael Kirk and Jeffery Hatch worked together to create an app called Report It, that reports crimes near a user by allowing the user to take a photo and write a description of the crime. This report can be seen as a pinpoint on all devices using the app, which can then warn other civilians about areas to avoid and aid law enforcement officers in their investigations. The key to placing during this competition seemed to be the fact that the members wanted to create something that would help the community, while simultaneously making sure that the idea would follow through to a completed, working app. These students are clearly interrupting the status quo and are ready to transform the world. Congratulations to these young men on their innovation and intent to serve their community.